Be-IT is delighted to be involved with BJSS, the Queens Award for Enterprise: Innovation technology and business consultancy with an impressive, 25-year track record of enterprise-scale delivery and more than a thousand experienced consultants, including over 30 in Scotland. In fact, BJSS’s growing presence in Scotland reflects their commitment to the country and the excellent job they are doing in both the public and private sectors north of the border. 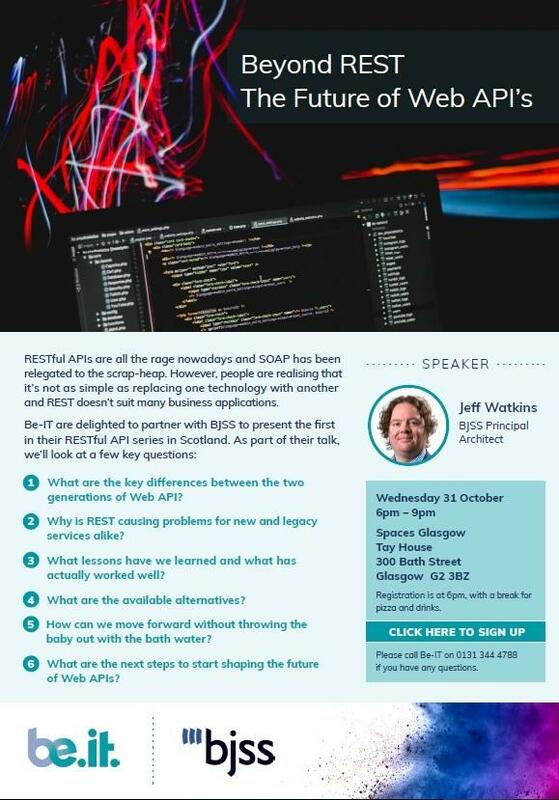 Consequently, what they have to say is well worth listening to, which you can do at this latest session, “Beyond REST – the Future of Web APIs” - held at Tay House, 300 Bath Street, Glasgow, on 31stOctober. To register, follow this link, and more information is contained on the e-flyer below.